William Germano, professor and former dean of the Faculty of Humanities and Social Sciences, will deliver a free, public lecture on Monday, October 16th based on his new book, Eye Chart (2017, Bloomsbury). Part of "Object Lessons," a series of volumes by the publisher about "the hidden lives of ordinary things," that include socks, jet lag and whale songs, Eye Chart is a short (176 pages), energetic examination of the history of the modern eye chart and its impact as a medical device, a work of graphic design, and a cultural meme. "About ten years ago I gave a lecture on visual measurement in the 17th century," Germano says, explaining the history of the book. "The first printed document to provide a graphic tool for measuring vision was published in 1623 in Spain. Since that lecture I had always wanted to write something about vision and ideas about visual measurement and graphic design. The Object Lessons series had just come out so I pitched my idea to the editors." The eye chart as we know it was developed in 1862 by Herman Snellen, a Dutch ophthalmologist who used scientific principles to figure out a graphic for testing eyesight. It consists of 11 lines of characters, originally letters of the Latin alphabet, made up of a font that uses equally-weighted strokes for each part of the letter where the size of the characters becomes increasing smaller from top to bottom. It became ubiquitous around the world when the British Army adopted it to test recruits throughout the British Empire during the late 19th and early 20th century. Because the nature of the characters doesn't matter much, only that the design follow a certain "grammar," the Snellen eye chart became globally versatile. Although Professor Germano has taken a sabbatical for the Fall semester he returns to Cooper Union on October 16th in the Rose Auditorium [watch the lecture] as part of the Herb Lubalin Lecture Series put on by Type@Cooper. While the subject will be the eye chart in general, the lecture will be tailored more towards its place as a work of typography and graphic design. "The equal weight of the stroke is part of the principle," Germano says. "Snellen wanted to be sure that the same visual information is reaching the eye in each part." Hence he chose a monoline typeface. He didn't really want to use serifs, Germano says, but early in the chart’s life others reproduced it with serifs because, "that's what they thought letters should look like." 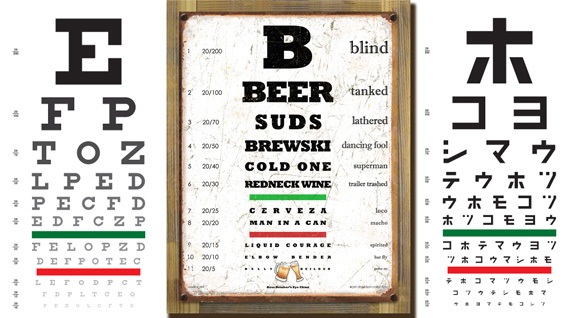 The eye chart has become a cultural meme, adapted for a myriad of visual jokes and messaging. "There was a wonderful eye chart developed in India that incorporated elements from the 60 or so native languages. I don't think it would have any diagnostic utility, but as a way of demonstrating the diversity of languages and cultures it's using the idea of the eye chart, of how closely you look, what do you perceive --do you understand discriminations between forms--as a way of commenting on linguistic diversity." Germano has worn glasses his whole life, and so, as a patient, he has been considering the chart for many years. He has become somewhat philosophical about it. "Yes, it's a scientific tool. Yes, it has also become a tool for making a joke on t-shirts, etc. But it also has to do with thinking about the limits of what we can see and the limits of what is to be engaged in the world. Twenty-twenty vision, which is not meant to be perfect -- it is meant to be "average" -- is nothing compared to what a bird sees, or a fly. The more one thinks about the limits of visual strength and visual acuity the more one finds oneself reflecting on what we cannot see. And whether the limits of our vision are somehow bound up with our own sense of identity." But Eye Chart does not read like a monograph. Instead it has been written in the style of a really long article from a magazine and seems meant to be something you can pick up and read on plane or a Sunday afternoon. The format of the book is pocket sized and illustrated. Mr. Magoo makes an appearance, as do Superman, tattoos, and eye chart shot glasses. "I think most people will find this material completely unfamiliar," Germano says. "You think you know what an eye chart is and you discover that it kind of touches on a lot of things: vision, science, popular culture, graphic design and the extent to which we rely on the sense of our eyes and our vision to know who we are."